This day-long Body Mapping workshop, led by Vanessa Mulvey, is an opportunity for performers and teachers to immerse themselves in the fundamentals of Body Mapping. 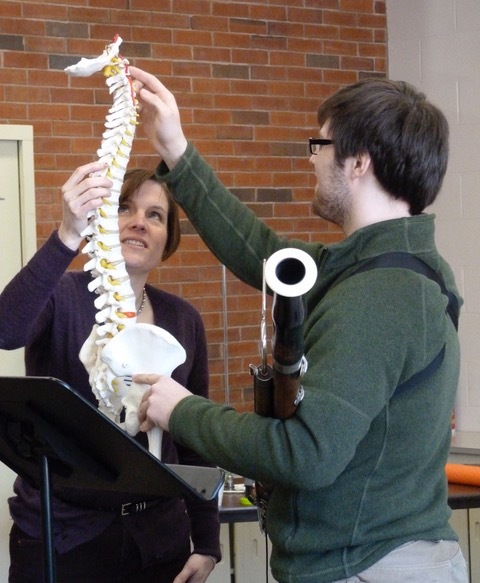 Body Mapping has helped countless musicians enhance performance efficiency, reduce performance stress, and increase each performer's capacity for expression. This workshop is perfect for wind players who want to capitalize on their lung capacity, vocalists who want to free their physical form for better performance, pianists who want to reach their technical and expressive potential, and string players who want to ensure healthy playing arms. Body Mapping illuminates the accurate anatomical design of movement as it relates to music-making. Workshop topics include: optimizing attention and the music-making senses, balance for sitting and standing, breathing, and arm and hand movement. Each topic includes hands-on playing opportunities, along with memorable strategies to integrate into practice and performance. With the help of Body Mapping, performance confidence grows as expression flows. This workshop is perfect for college and adult musicians (amateur through professional) as well as advanced high school students. The workshop also provides valuable teaching tools for studio teachers and music educators. To register with either of the discounted fees, please email the Summer Programs Office, and notify them if you are a current NEC student, faculty or alum. We welcome ages 14 and over, and at all proficiency levels.